We are one of the leading manufacturers of the Solenoid Valves. 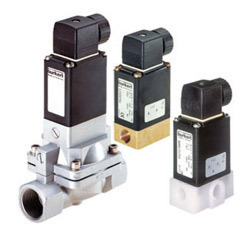 The operation of Solenoid Valves is similar to that of a light switch, but typically controls the flow of air or water, whereas a light switch typically controls the flow of electricity. Available in single action, double action, our valves are fabricated using quality tested raw materials like aluminum. These are designed to handle the most demanding fluid control applications for air, gases and oils.